Background: During the late thirteenth century, the Delhi fell into the hands of Ghurids (Turko-Persian dynasty). The city of Chauhans became an administrative unit of Ghurids North Indian provinces. 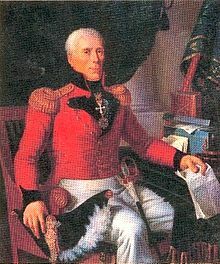 Qutubuddin Aibak (Turkish slave of Ghori) was appointed as an administrator of newly conquered provinces. With the death of Muhammad Ghori in 1206, the Turkish general Qutubuddin declared himself as a sultan of Indian provinces of Ghurid empire with its center at Delhi. “Mamluk” is an Arabic term that became synonymous for the Turkish slave’s soldiers who became the backbone of expanding Abbasid empire in eight century. By the tenth century, the Mamluks established themselves as kingmakers in decaying Abbasid Caliphate. For the coming centuries, the Mamluks emerged as the most powerful force to control disintegrated provinces of vast Saracenic empire in Central Asia, West Asia, and North Africa. The young Turkish slave Qutubuddin was sold by his master to Ghurid Sultan, Muhammad Ghori and later emerged as one of his successful army commandants. That’s why the first ruling Islamic dynasty of North India was known as Mamluk/Slave Dynasty. The enthronement of Qutubuddin in 1206 marked with a new era of the Delhi first city “Mehrauli” that was characterized by the growth of art, culture, and architecture. It was a unique blend of Indian, Persian and Saracenic civilization. Mamluks dynasty lasted for almost next eighty years when it was replaced by Khiljis. In the span of eighty years, they left behind a rich heritage of art and architecture especially at Mehrauli that was the center of power for Hindustan during their reign. The magnificent capital city of Mehrauli even received emissaries from West Asian monarchs during Mamluks reign. The grand construction of Mehrauli was comparable with its sister cities in Egypt, Asia Minor, Persia, and the Levant in those days. For the subsequent dynasties, the power center moved away from Mehrauli on some occasion even outside the Delhi. But the Mehrauli retained its unique distinctions as the first city of Delhi built on the ruins of Chauhans by Turkish Sultans. 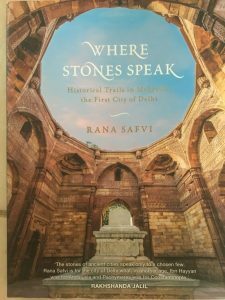 WHERE STONE SPEAK Historical trail in Mehrauli, the First City of Delhi is a book authored by a noted historian & columnist, Rana Safvi and published by Harper elements in 2015. The book started with a brief introduction to the settlements of Delhi starting from 1450 BC right up to the grand Colonial construction of Sir Edwin Lutyens in early 20th century. After the introduction, each chapter is titled with main monumental sections of the Mehrauli starting from Qutub Complex and ends at Mehrauli archeological park. The chapters were integrated with the stories and traditions that were build up down the centuries in context with these monuments. 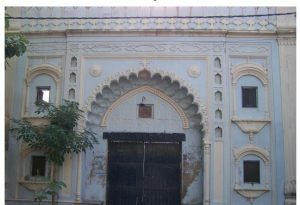 For example, the historical origin of Sair e Gul Faroshan in the chapter titled “Khwaja Qutbuddin Bakhtiyar Kaki” reflected the Hindu-Muslim harmony and cultural fusion of early 19th century Zafar’s Delhi. The syncretic culture was evolved down the centuries in the Indian subcontinent by fusion of Indian, Arabic and Persian traditions. Integration of Sufism with Indian culture and explanation of the appellations like “Maula” with an appropriate synonym for Caliph Ali carries a larger impact on contemporary Islamic teachings where many opponents consider it as a heresy. The last chapter titled ” Tomb of Sultan Ghari” was added although monument lies five km away from Mehrauli as the monument is closely knitted with the history of early Mamluks in India. The authors vivid description of the monuments from Lalkot/Qila Rai Pithaura (11th-century fort built by Anangpal II) to Zafar Mahal ( summer palace of last Mughal, Bahadur Shah Zafar) gave readers a historical journey in the timeline of monuments. Every single monument of Mehrauli from Sanderson’s Sundial to Qutub Minar was explained with rich narrations and historical description. The beautiful description of spiritual monuments from Yogmaya temple to the Dargah of Aashiq Allah reflected the role of mystics and mendicants in the first city of Delhi. Even though, a frequent visitor to Mehrauli, I came to know the detailed background of Sheikh Shahabuddin alias Ashiq Allah from “Where Stone Speak”. 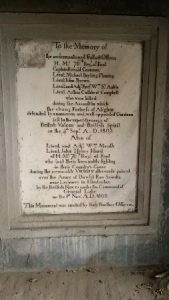 Its a great effort in documenting the history of fading monuments of Mehrauli. The beautiful photographs by Syed Mohammad Qasim fit as visual data for the text that facilitate the in-depth understanding to the readers. 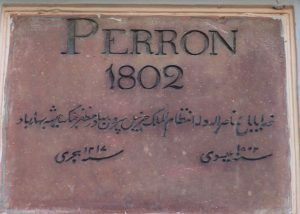 The integration of poetic verses of Persian, Urdu, Hindi and Punjabi language with photographs of the monuments provide a contextual understanding to readers. This is the unique component of the book that reflects the in-depth understanding of the author in oriental languages and her creativity in integrating it with text. 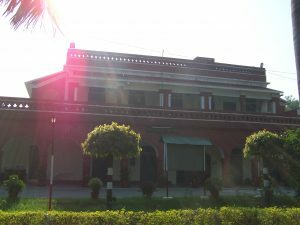 In an interview given to Swati Daftuar (published on 12th September 2015, The Hindu) before the release of the Book, the author told how she managed to collect a wide range of references from the archeological society of India (ASI) research and records to the early 20th-century oriental account of Bashiruudin Ahmad. Other than its esteemed readers, the book will serve as a reference for future researchers and travel writers. To my knowledge, other than Rana Safvi account, no other book has been published on the “Mehrauli: the first city of Delhi” documenting monumental history by applying the unique approach of integrating poetic verses and contextual stories. In last two years, multiple reviews of the experts have been published in magazines and newspaper. My review can be simply considered from a reader’s perspectives. “WHERE STONE SPEAK” articulates history of first city of Delhi by giving voice to its silent monuments"